Today’s Think Kit Prompt: What habits did you start this year that you want to continue? What inspired you to get in a new groove? Will you continue into 2014? Every year, I say that I’ll be better about working out, eating healthy and taking care of myself. And every year, I fall off the wagon when a social event comes up, a cocktail is offered or a delicious slice of pizza is placed in front of my face. So while once again, I will pledge to make it a habit to be healthier in 2014 (as I eat macaroni and cheese while typing this), I have a better plan that I know I can stick to. I read an article the other day titled 15 Reasons Couples Should Go On Vacation Instead of Buying Stuff. If you’ve ever traveled with your significant other or a friend, you realize how special that experience is. The two of you bond over new experiences and get the chance to spend quality time together. There’s something about being in a strange place with just the company of your best friend that makes for a great time. One of my best memories is from a trip to Hawaii with my boyfriend. 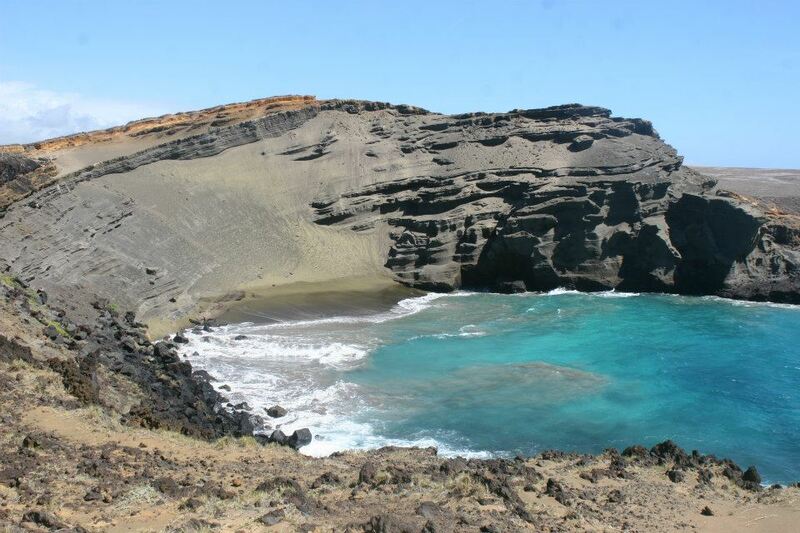 We heard about the green sand beach from several people and were told that it was a must see on the Big Island. We woke up early, grabbed breakfast and drove down to the southern part of the island. The thing about the green sand beach is that it isn’t accessible by car, you have to park and then hike for a little over an hour to get there. Since it was around 7 am, there weren’t many other people out there. In fact, we really only saw two other people hiking along the sand and rocks when we got there. We quickly passed by them and continued on our trek. About halfway through our walk, I looked around and realized we couldn’t see anyone for miles around us. It was just the ocean on one sand and sand and rocks on the other. So we continued our walk, stopping to take pictures from time to time because it was so beautiful. 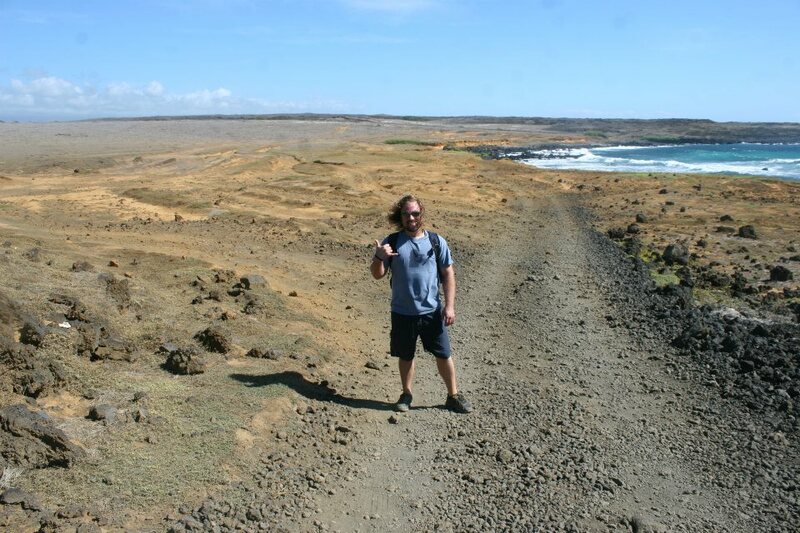 Ryan on the road to the green sand beach. After over an hour of walking and nothing in sight, I started to worry that we were lost. Or that the beach didn’t really exist. I was especially concerned since we were the only ones around in the middle of nowhere. But we continued walking. On a side note, let me just say that if you ever do this hike, do not wear flip flops. I learned the hard way. Eventually, an old, beat-up Jeep came driving up and stopped a little bit down the road from where we were walking. People piled out of the Jeep and starting walking down the side of a cliff. I realized we had found the green sand beach. We followed them down the side of the cliff and onto the green sand beach. I felt so accomplished after that long trek, and I most definitely wouldn’t have done it without Ryan. Sharing a moment like that with him was so awesome and something that only the two of us will understand. Well, unless you’ve been there…then you get it. 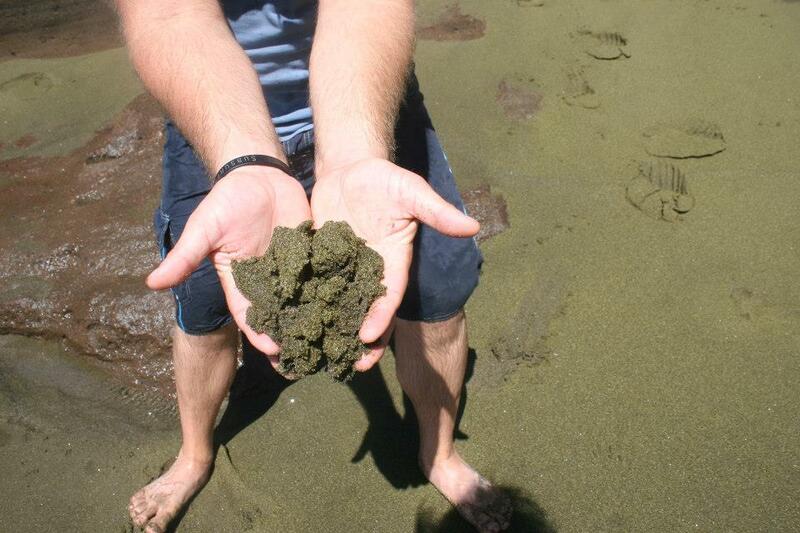 Ooooooh green sand! So sparkly! We ended up finding out that there are several people who have permission to drive the bumpy trail back and forth from the green sand beach in their beat up Jeeps, so we ended up paying a random person $10 to drive us back to our car from the beach. We experienced so many other great new things during that trip, like snorkeling in a dolphin refuge, attempting to see a live volcano, making terrible Air BnB reservations at a serial killer’s house (ok, the serial killer part isn’t confirmed but I’m pretty positive it’s accurate), visiting the most beautiful beaches I’ve ever seen and eating the best, fresh fish of my life. For the rest of our lives, we’ll have these memories together. You can see the rest of our pictures here. Back to the article, one point it makes is that for the price of 2 iPads, you can travel abroad. An iPad is only going to last for so long. A trip gives you memories to cherish forever. And I’m looking forward to creating many more memories, including trips in 2014 to New Orleans, New York and Barcelona. Tags: big island, green sand beach, hawaii, memories, serial killers, snorkeling, vacation. Bookmark the permalink. I am so completely loving your blog!!! !